The era of electricity retailers trying to directly sell and install rooftop solar is coming to an end. Electricity retailer Direct Energy started winding down its residential solar installation business last week. Direct Energy Solar will continue to operate its commercial business and plans to maintain its existing fleet of rooftop installations. The pivot away from residential affects approximately 330 employees, making up a considerable portion of the company's overall solar unit. Those employees have been given an opportunity to seek other jobs within the broader company. Direct Energy, a subsidiary of Centrica, appears to have been the last national electricity retailer with its own residential solar business. NRG Energy closed its rooftop solar installation business in February. And earlier this month, it decided to sell off its renewable power plants too. Edison Energy, the renewables and energy services arm of Edison International, has undergone an executive-level shakeup and a strategic review by the parent company. Customer acquisition costs have weighed heavily on large multistate solar operations, even as the cost of components has fallen. That dynamic has played out in the pure-play residential solar world, where the top three national installers have lost market share to smaller local and regional installers, whose customer acquisition costs tend to be lower. 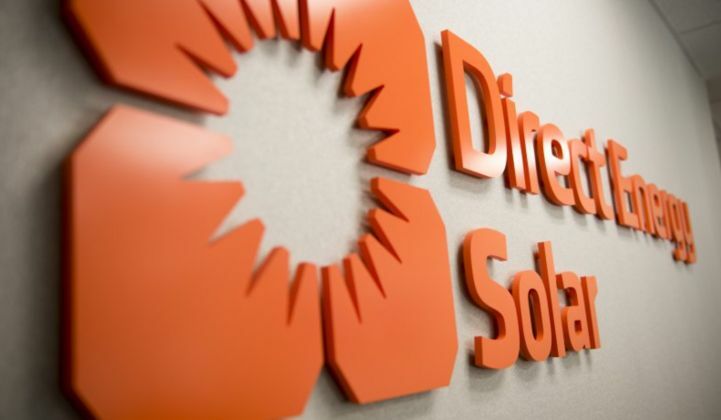 Direct Energy plans to leverage its experience in residential solar marketing and retail energy to explore the community solar market in the Northeast, sources familiar with the decision said. The Distributed Energy and Power team within Centrica will also eye behind-the-meter storage projects, although details remain scarce on these new operations. Community solar would offer a way to sell solar power to residential customers without the operational costs associated with installing and maintaining a scattered fleet of rooftop projects. Direct Energy could have an advantage based on its access to retail customers. "Customer acquisition costs for a third-party developer for community solar can be as high as they are in the residential business, but a retail electricity provider has the ability to acquire customers for less money, because they already have those points of contact," said Allison Mond, a solar analyst at GTM Research. The behind-the-meter storage markets on the East Coast have yet to take off, due to limited available revenue streams. New incentives in Maryland and Massachusetts could prove useful. The company started life as Astrum Solar in 2008, and was acquired by Direct Energy in 2014 for $54 million. At the time, the move was hailed as "another sign of the solar industry's health and dynamism." The rebranded entity primarily served the mid-Atlantic and New England states. The idea was to scale Astrum's solar installations by connecting it with Direct Energy's 6 million residential customers. Direct Energy, which already provided energy, HVAC and plumbing services to homes, understood how to acquire and service customers at a low cost and could "cross-sell solar services," an executive there told GTM at the time. That didn't quite work out as planned. The installer's peak on GTM Research's PV Leaderboard came before the acquisition, in Q3 2013, with 1.6 percent market share. As of Q1 this year, Direct Energy Solar had fallen to 0.6 percent. Much of that lost installation volume was in its core market of Massachusetts, where customer acquisition challenges have plagued many residential installers. Employees learned of the decision on July 12. Some of the operations staff were asked to stay on to carry out installations already in the pipeline. The residential installation operation will wind down by the end of the year. This company is not alone in this transition. Several large energy companies that added solar installation to their energy services portfolio have had a hard time. In addition to NRG and Edison Energy, GE's Current has struggled to define its broad portfolio that includes smart lighting, solar, EV charging, energy storage and energy management services for commercial and industrial customers. The group underwent strategic restructuring in December to focus more on lighting and analytics.